2019 Heartfelt Creations Design Team. Heartfelt Creations blog and following the instructions there. 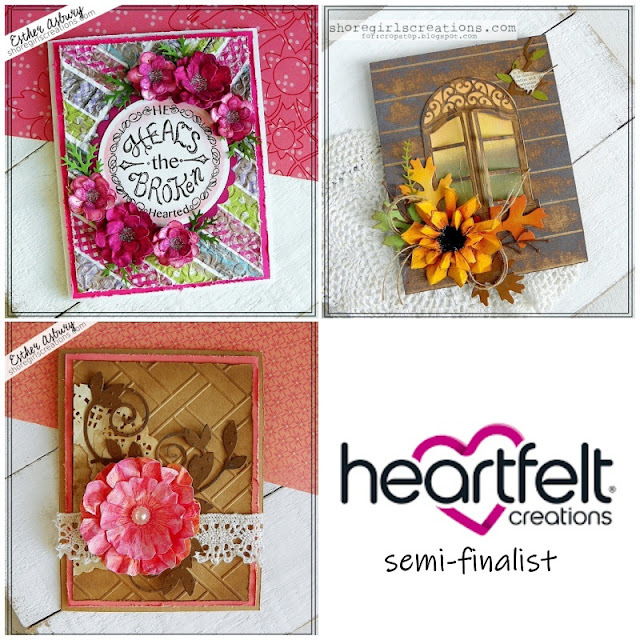 Congratulations on being one of the semi finalists with Heartfelt Creations! Good Luck! Esther, I saw you were a semi-finalist and wanted to come and say congrats and good luck! I love your crafty style and hope you get a chance to do more of what you love. Esther, my friend... Congratulations!!! I hope tou will make it through. Love your cards! Congrats that is great that you are going for the team, you will be great, I voted for you, Good luck! I voted for you! I hope you win, I love your cards! Big congrats on being a semi finalist! Congratulations on being a semi finalist! Your work is just lovely! Hurrah! Your work is beautiful, so no surprise! Good luck, Esther! These are beautiful. Good luck! Congratulations, Esther! My vote is cast for you!! Good luck. You, my dear, are a shoe-in! Voting for you! Hugs! Fabulous cards, my vote is in, fingers crossed and prayer said! I just voted for you, Esther. You deserve to win! Good Luck.